The concept of affordances is a slippery one. Although it seems simple enough on the surface, when you begin digging a little deeper, things become confusing. Hence this series of posts. In part one, I explore what the concept of affordance means, and identify my suggestions as to the affordances of a personal learning network. In part two, I will present some suggestions of what may be some of the affordances of a PLN, based upon the research in part one. I hope you find this interesting and useful! There is a great deal of ambiguity and confusion over the term affordance, and how it is used. This is evident in that even in the research papers I read, there were noticeable contradictions. A lot (but not all) of this ambiguity comes from the fact that the notion of affordance has two different, yet overlapping definitions, developed from two different points of view. Gibson initiated the popular use of the term affordance in 1977. He was a perceptual psychologist, and his purpose in understanding affordances was so that we could better understand how we perceive the environment in which we find ourselves. In 1988, Norman took Gibson’s work and altered it to meet his somewhat different needs. Norman is an expert in the fields of design, user experience and cognitive science. He was interested in explaining how we might improve design, so that utility, or how an object might be used, might be more easily seen. It is this difference in fundamental approach which has led to the overlapping and yet different interpretations of affordance, and this causes confusion. 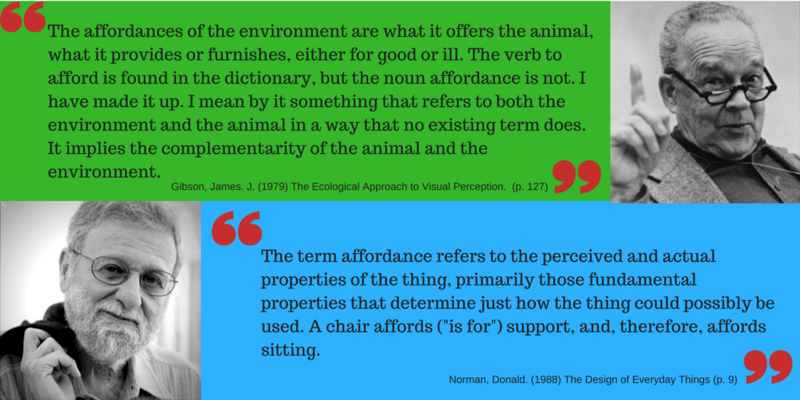 We still haven’t agreed on one single definition of affordance, and therefore people tend to make meaning from Gibson’s perspective, from Norman’s, or in many cases, from a mash up of the two. Gibson’s work was relational – affordances could only be understood in light of the relationship between the specific actor and the environment at that specific point in time. In this way, Gibson’s definition of affordance relates strongly with networked learning. Networked learning considers learning to be relational as learning cannot be limited or isolated to the individual’s own cognition or drawn purely from the social context and the interactions with it – it’s the interaction between the individuals own thinking and the connections in the network along with the learning context that determines the learning. However, Norman’s focus upon design is also influential when thinking about how we learning within networks, particularly when viewed from a connectivist and connected learning perspective (both of which draw upon networked learning). Connected learners design and work within designed connected learning environments. In the connectivist approach to learning, learning is considered to be the active construction of connections and the construction and manipulation of networks, wherein knowledge exists – visualised by Siemens as a ‘series of pipes through which information flows’ (1995). For this construction and manipulation of networks to occur effectively, some thought must go into the design of the network – who or what constitutes a node in the network, and how strongly this node is tied. It seems that learning and design are inextricably linked, and therefore, it is important to consider what Norman shares about affordances and design. 3. Affordances seen within a relationship (usually between a person and a thing, but potentially between an animal and their environment, or even two objects, such as a computer and software). Drawing upon both Gibson (for the relational aspects) and Norman (for the focus on design and user experience) for understanding, I then turned to the work of Conole and Dyke (2004), boyd (2011) and Gogia (2016) to explore the affordances of a personal learning network (PLN). If affordances are present within the relationship between the actor and the environment, and we see the interaction of the person, resources and environment as how learning occurs, then an examination of the affordances of the network may provide useful insights into how it might shape particular actions. I draw this conclusion based on boyd’s statement that “networked publics’ affordances do not dictate particular behaviours, but they do configure the environment in a way that shapes particular engagements’ (2011, p.39). Conole and Dyke (2004) focus on creating a taxonomy of the affordances of Information Communication Technologies (ICTs), while boyd (2011) defines the affordances of networked publics and Gogia (2016) outlines affordances of the Open Web. Many of the affordances identified in this research align with PLNs. I have grouped them below in Table 1, along with a suggestions for the affordances of a PLN, based upon this previous research. The affordances of the PLN may exist only when the individual is learning within the context of the network. A PLN consists of individuals, groups of people, resources, information sources (nodes in the network) and the tools which enable the connections between these nodes to be made. An individual person, a specific tool such as Twitter, or an information source will certainly have affordances for learning, and some of these may overlap, however this combination of affordances is possible only when all parts of the PLN come together. Part Two of this post will explain each of the affordances of the PLN, and describe how they link to, or are inspired by the affordances outlined in the previous research. Hi Kay – I am enjoying your posts and agree about the confusion around affordances, which made me think about a couple of links which you may be interested in. Thank you so much for sharing these links- I’ll definitely check them out before I begin part 2! I’m glad you have found my posts interesting, it’s such a fascinating subject. ?